electrical loads in the home. meaning of a metric prefix, such as "milli-". The unit of electric current in SI, 20 May 2019 – present, one of the base units. Symbol A. It is defined by taking the fixed numerical value of the elementary charge e to be 1.602 176 634 × 10⁻¹⁹ when expressed in the unit C, which is equal to A s, where the second is defined in terms of Δνcs. 26 CGPM, Versailles 13-16 November 2018. Here C is the symbol for the coulomb, the SI unit of charge. Since e = 1.602 176 634 × 10⁻¹⁹ C, C = 1/e = 1/(1.602 176 634 × 10⁻¹⁹), which makes the ampere a flow of 6,241,509,074 × 10⁹ elementary charges per second. e, the elementary charge on the proton. It was assigned the value quoted in the definition above, which is compatible with the experimentally determined, pre-definition values used earlier. the unperturbed ground state hyperfine transition frequency of the cesium 133 atom (which is the Δνcs in the definition), set at exactly 9 192 631 770 hertz. Specifying in hertz the value of a particular naturally-constant frequency is a way of defining the second. Recommendation 1 of the 94th meeting of the CIPM (2005) anticipated the ampere would be redefined at the 24th CGPM in 2011. At that meeting (Paris, October 2011), the CGPM again only declared its intention, but gave fuller details. The value of the elementary charge e was to be made a matter of definition, rather than something to be determined experimentally. The new value was to be exactly 1.602 17X × 10⁻¹⁹ coulombs, where X stood for one or more yet to be determined digits. Additional years of experimentation, measuring e, enabled metrologists to increase the precision by 4 more decimal places by 2018. From shortly before 1990 to 20 May 2019, in practice experimenters at the highest levels used an ampere that was not the SI ampere. This divergence resulted from the appearance of radically new quantum voltage and resistance standards, which reduced the uncertainty in measurements by orders of magnitude. In 1962 Brian Josephson, a graduate student at Cambridge University, predicted a certain phenomenon on purely theoretical grounds.¹ The following year experimenters verified its existence,² and it has since been named the Josephson effect. A superconductor is a material in which pairs of electrons can flow without any resistance, providing the material is chilled below its transition temperature (say, 4 kelvin, depending on the material). Imagine two pieces of superconductor bathed in liquid helium and separated from each other by a very thin layer of electrical insulator (say, a few nanometers thick). Josephson predicted that in such an arrangement pairs of electrons could “tunnel” (a term of the art) through the insulator. The arrangement is now called a Josephson junction. where n is a small whole number (such as 1, 2, 3, etc. ), e is the elementary charge and h is the Planck constant. The quantity 2e/h is now called the Josephson constant, whose symbol is KJ. Following the adoption of fixed values of e and h by the CGPM, the Consultative Committee for Electricity and Magnetism (CCEM) calculated from them the value KJ = 483 597.848 416 984 GHz V⁻¹ for the Josephson constant. So now the volt standard depends only on the second, and time is currently by far the most accurately measured dimension. The first voltage standards using the Josephson effect produced only 1 to 10 millivolts, which is awkwardly small for metrological purposes. To boost the voltage, junctions were wired in series, the way flashlight batteries are wired in series to get 6 volts from four 1.5-volt batteries. This approach topped out at around 20 junctions, because it required touchy regulation of each and every junction's bias current. 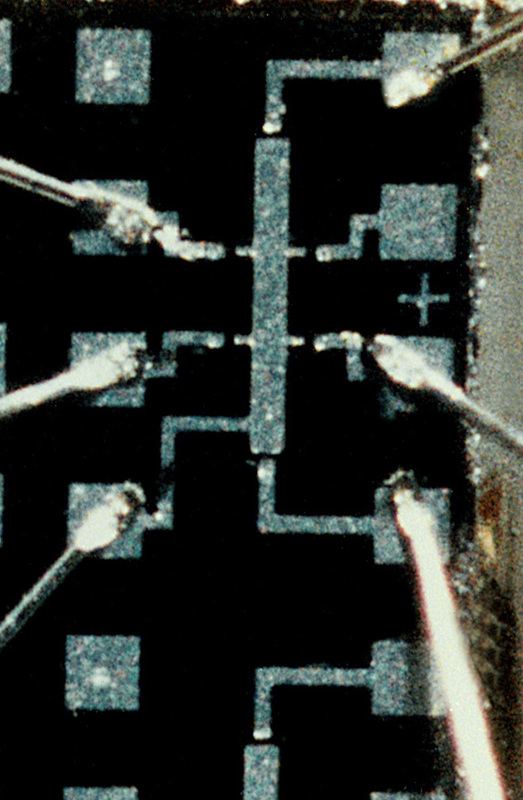 In 1977, Levinson et al³ suggested a different circuit that eliminated that problem. 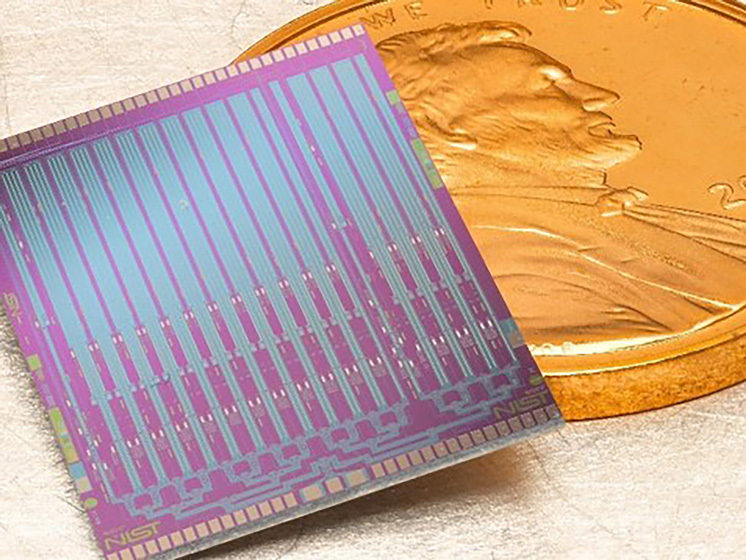 In today's Josephson voltage standards, a single chip may contain tens of thousands of Josephson junctions. A false color scanning electron microscope image of Josephson junctions on a chip. The blue and red elements are made of superconductors. The green material is an insulator, which extends beneath the blue layer, separating it from the red. 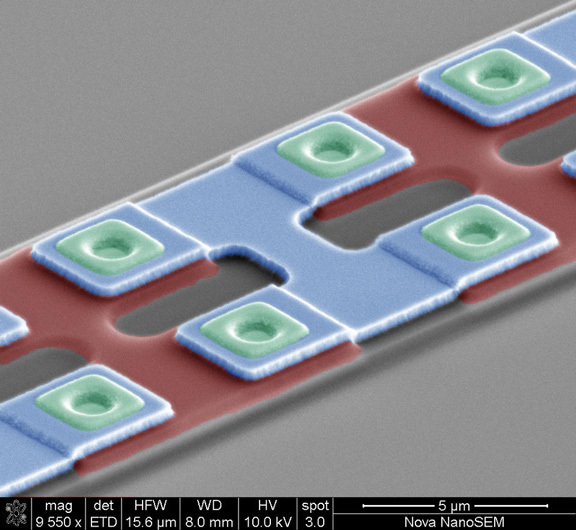 Thousands of Josephson junctions on a single chip. Possible new effects in superconductive tunneling. Physics Letters, vol. 1, issue 7, pages 251-253 (1 July 1962). 2. P. W. Anderson; J. M. Rowell. Probable observation of the Josephson Tunnel Effect. Physical Review Letters, vol. 10, issue 6, pages 230. (15 March 1963). Josephson Currents in superconducting tunneling: The effect of microwaves and other observations. 3. M.T. Levinsen, R.Y. Chiao, M.J. Feldman and B.A. Tucker. An inverse ac Josephson effect voltage standard. In 1879 Edwin Hall reported an effect⁴ now called the ordinary Hall effect. Imagine a metal strip with an electric current flowing through it. When a magnetic field is applied perpendicular to the surface of the strip, an electric potential appears between the opposite edges of the strip, at right angles to the current. This potential is called the Hall voltage. It occurs because magnetic fields bend the paths of moving electrons. The ratio of the Hall voltage to the current through the strip of conductor has the same dimensions as the ohm, and is described as the Hall resistance. In the ordinary Hall effect the Hall resistance can be varied continuously, for example, by changing the strength of the magnetic field. Fast forward a hundred years to a time of semiconductors, liquid helium and quantum mechanics. A theoretician, working with math, had predicted the Josephson effect. In contrast, an experimenter working with a transistor discovered the quantum Hall effect (QHE). However, he immediately realized the quantum nature of his discovery. Transistors are made of semiconductors. A semiconductor is a material that under some circumstances conducts electricity, and otherwise is almost an insulator. The element silicon is commonly used to make semiconductors. To turn pure crystalline silicon into a semiconductor it is “doped”, that is, non-silicon atoms are added. Every semiconductor is one of two types, n-type or p-type. The choice of the added atoms determines what type it is. Certain atoms, for example, arsenic, make a semiconductor with extra electrons, an n-type semiconductor. Adding atoms of certain other elements, for example boron, creates an excess of “holes”. Holes are places where an electron could be but isn't, and act in effect as positive charges. Boron-doped silicon is a p-type semiconductor (p for positive, n for negative). In a semiconductor, holes and electrons can move around. The device in which QHE was discovered was a kind of MOSFET transistor. Think of it as a sandwich. On the bottom is a layer of p-type semiconductor. But two spots on the surface are doped n, and given wire contacts. One is called the source and the other the drain. The goal is to regulate a current flowing from source to drain through the p-type semiconductor. On top of the semiconductor is a thick layer of insulator, in this case silicon dioxide. And finally, on top of the insulator is a metal layer, a good electric conductor. This layer is called the gate. Like the source and drain, the gate is connected to the outside world by a wire. The gate on top of the insulator forms a capacitor-like arrangement. When the gate is positively charged, its electric field attracts electrons in the semiconductor to the surface between the semiconductor and the insulator. There a very, very thin layer, called the inversion layer, becomes a conductor, and current can flow from source to drain. The greater the charge on the gate, the greater the current. There are many variations on the MOSFET design. Some amplify a continuously changing current, to send music to loudspeakers, for example. Others are designed as switches, either on or off. 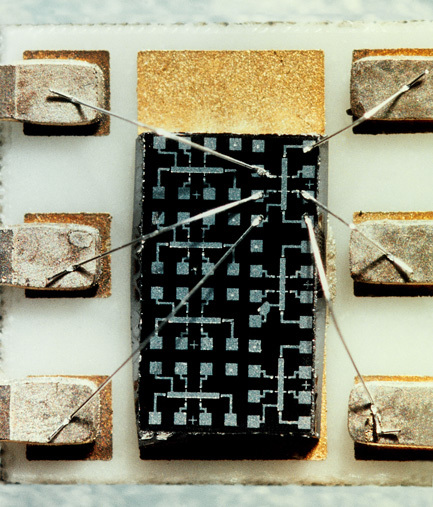 Any PC or smartphone contains billions of such MOSFET switches. If you follow the layers from the top down, you can see where the name MOSFET comes from: Metal, Oxide, Semiconductor, electric Field Effect, Transistor. Klaus von Klitzing had studied the Hall effect for a number of years, and became interested in investigating the Hall effect in the inversion layer in MOSFETs. The inversion layer would play the role a strip of metal does in the ordinary Hall effect. He was not the first to do this. For this study his collaborators manufactured special MOSFETs. The two photographs below show the actual device in which QHE was discovered. Notice, for example, that the gate is long and skinny, which is not a typical MOSFET design. A long skinny gate was necessary to get a section of the inversion layer well away from effects of the contact between the n-type semiconductors and their metal contacts. Also, more than three contacts are brought out. The extra contacts made it possible to measure some aspects of what was going on inside the working MOSFET, in particular, the Hall voltage. Silicon chip on which Klaus von Klitzing discovered the quantum Hall effect. The upper right wire is the drain and the lower right wire the source. The gate is the bottom left wire. The two middle wires made it possible to measure the Hall voltage. Besides the lab's measuring equipment, two essential requirements were not part of the MOSFET. One was refrigeration capable of lowering the temperature of the MOSFET to 1.5 kelvin. A powerful magnet was also needed. The most powerful magnet available in von Klitzing's lab (18 tesla) was only available at night, so he did his research at night. Around 2 am in the morning of 5 February 1980, the x-y recorder drew a chart containing the line shown below. It tracks the Hall resistance as the gate voltage is increased. Adapted from figure 2, Klaus von Klitzing, 25 Years of Quantum Hall Effect (QHE). A Personal View of the Discovery, Physics and Applications of this Quantum Effect. Séminar Poincaré, 2 (2004) pages 1-16. AS the gate voltage increase, the Hall resistance does not decrease smoothly. Instead, there are plateaus, places where the gate voltage increases but the Hall resistance doesn't change at all. It is quantized. The values of the Hall resistances on the plateaus were all multiples of about 25,813 ohms (after correcting for the impedance of the x-y recorder). Von Klitzing recognized this number. It is h/e². The values of the Hall resistances on the plateaus were all multiples of the Planck constant divided by the square of the elementary charge. where n is a small whole number, h is Planck’s constant and e is the elementary charge. The value of this effect to metrology was so obvious that the very next afternoon von Klitzing was on the phone to the Physikalisch-Technische Bundesanstalt, Germany's national metrology institute. Later h/e² was named the von Klitzing constant, symbol RK. Its numerical value, 25 812.807 ohm is known as the quantized Hall resistance. 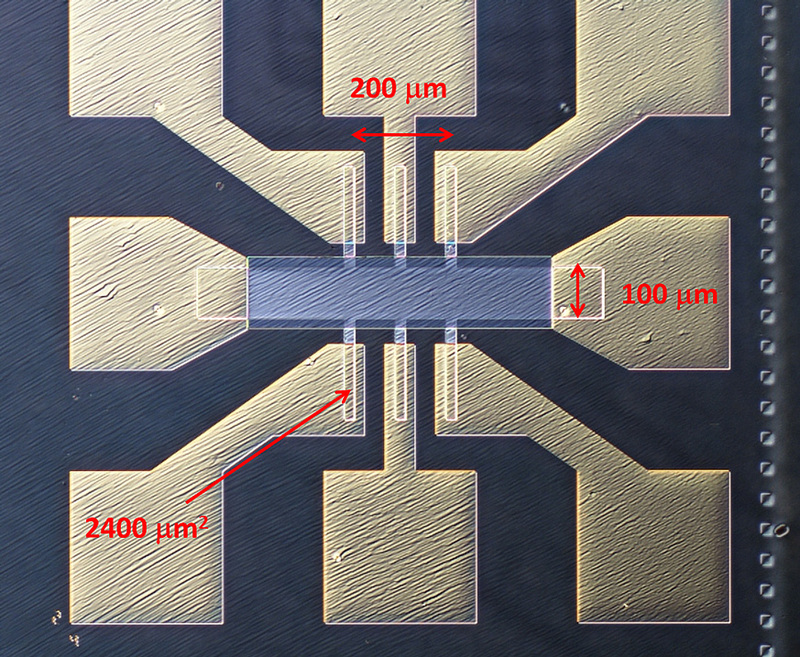 A sophisticated quantum Hall device made at NIST. The blue-gray rectangle in the center is the open face of the Hall bar. The locations of graphene components are outlined by white lines. Current is applied through the contacts at the left and right ends of the bar. The Hall voltage is measured through the triplets of contacts above and below the bar. Notice that in both the quantized Hall effect resistance device and the Josephson voltage device, making the quantum effects observable depends on minimizing “noise” from the macro world: by extremely low temperatures and by confining the electrons to an exceedingly thin plane. Today's devices are much more sophisticated than von Klitzing's MOSFET, or the early Josephson junctions, To get the necessary thin layer of electrons, many devices use graphene, a layer only 1 carbon atom thick. YouTube hosts several worthwhile videos on the Hall effect. An English professor demonstrates the effect of a magnetic field on the paths of electrons, and models the ordinary Hall Effect. A university-level talk, by a professor at Northwestern, all the way to the fractional Hall Effect. On a new action of the magnet on electric currents. 5. K. v. Klitzing, G. Dorda and M. Pepper. New method for high-accuracy determination of the fine-structure constant based on quantized Hall resistance. The original title of the paper was “Realization of a Resistance Standard based on Fundamental Constants”. A referee persuaded him to change it, as at that time there was more interest in the fine structure constant than the ohm. The inverse of the fine structure constant is equal to the von Klitzing constant times 2 divided by the product of the speed of light and the magnetic permeability of the vacuum. Both Josephson and von Klitzing received Nobel Prizes. During the period 1963 – 1990, various national metrological laboratories used slightly different values for the Josephson constant, and later for the von Klitzing constant. That complicated comparisons of results. To facilitate research, in 1988, at the request of the Comité Consultatif d'Electricité, the CIPM specified exact values of the constants effective 1 January 1990.⁶ Experimentalists proceeded to realize the ampere from “amperes equals volts divided by ohms.” In the literature, such work is often said to have been done in “conventional” units, an indication that SI units are not meant. The CIPM specified the symbol RK-90 for the conventional value of the von Klitzing constant and KJ−90 for the Josephson constant. Sometimes other symbols are given a subscript “90”, e.g., “V₉₀”, to indicate that the measurement was made with quantum device standards using the CIPM's exact values. To illustrate the fixing of the constants: the CODATA report for 2014 gives a numerical value for the Josephson constant of “KJ [=] 483 597.8525(30) × 10⁹ Hz V⁻¹”, but for “the conventional value of Josephson constant KJ−90 483 597.9 GHz V⁻¹ exact”. The same issue contains "New international electrical reference standards based on the Josephson and quantum Hall effects," by B.N. Taylor and T.J. Witt, and other related articles. Obviously, a system of units cannot have two different definitions for a unit. But it happens. A well-known example, in the metric system, is the definition of the cubic centimeter and the milliliter. Originally, the former was based on length, and the latter on mass (through the density of water). As measurement of the density of water became more accurate, the volumes of the two diverged. Yet a cubic centimeter was supposed to be the same volume as a milliliter. Not until 1964 did the CGPM fix the problem by changing the definition of the liter, making it a special name for the cubic decimeter. In practice, the ampere currently = volts/ohms. But by the new definition, and in practice in the not-too-distant future, the ampere = elementary charges/second. The current definition of the ampere, given at the head of this article, makes no mention of ohm or volt. All over the world, national metrological institutes are busy developing SEP (single-electron pump) or SET (single electron tunneling) devices that count the individual electrons entering a current. In most designs, the rate at which electrons are released is controlled by a input frequency. Unfortunately, so far they can only produce currents in the pA to nA range, too small for metrological purposes. The ohm, volt and ampere are locked together by Ohm's Law. Unlike, say, Newton's laws of gravitation, Ohm's Law is observational. We know no deep theoretical reasons for its truth. If the ampere as realized by counting charges is equal to the ampere realized from the volt and ohm, any uneasiness about Ohm's Law will be put to rest. If not, there will be big trouble. Stay tuned. Metrology marches on. The ampere is named for André Marie Ampère (1775–1836). The following definition was abrogated in resolution 1 of the 26th CGPM (2018). It was originally proposed by the CIPM in 1946 and adopted by the CGPM in 1948. One ampere is that constant current which, if maintained in two straight parallel conductors of infinite length, of negligible circular cross section, and placed 1 meter apart in a vacuum, would produce between these conductors a force equal to 2 × 10⁻⁷ newtons per meter of length. CIPM 1946 Resolution 2, approved by the Ninth CGPM in 1948. Since the setup described is purely conceptual, the ampere must be realized through calculations based on results from an actual setup. Using this definition, the ampere cannot be realized with an accuracy better than a few parts in 10⁷, barely good enough for today's needs, and not good enough for tomorrow's. It may seem as if this old definition, unlike that in the post-2018 SI, does not involve specifying the value of a fundamental constant. But it does: it sets the magnetic constant μ₀ = 4π∙10⁻⁷ Hm⁻¹ = 4π∙10⁻⁷ m∙kg∙s²∙A⁻². Under the new definition of the ampere, the magnetic constant must be determined experimentally. Previous to the 1948 definition, the ampere had been realized in a variety of ways: with delicate balances able to compare electrical and mechanical forces (see, for example, Weber), by electroplating defined masses of metal, and so on. See history of the ampere. Last revised: 27 April 2019.